Nicola Sturgeon has said she is “disappointed” by the vote to scrap a controversial law aimed at tackling sectarianism at football. 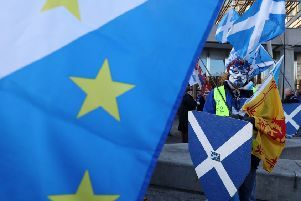 Opposition parties defeated the Scottish Government by passing Labour MSP James Kelly’s Bill to repeal the Offensive Behaviour at Football and Threatening Communications (Scotland) Act on Thursday. The Act was introduced by the majority SNP government in the last parliament in the face of united opposition from all other parties. Since coming into force in 2012, it has faced criticism from legal experts and fans’ groups who claim it is unworkable and unfairly targets football fans. Mr Kelly’s Bill - backed by the Conservatives, Labour, Liberal Democrats and the Greens - is understood to be the first passed at Holyrood with the sole purpose of repealing an Act of the Scottish Parliament and sparked concerns from opponents that it would leave vulnerable groups exposed to abuse. Questioned on the vote to scrap the Act, the First Minister said: “I’m disappointed. I think it was a retrograde step but I understand the concerns that were expressed and parliament has taken its decision so we move on now. “Obviously, we’ve had a concern about repealing the act before alternatives were in place but we’ve moved on from that.